FILE - Thai police stand guard as people pray during a crime re-enactment near the bomb site at Erawan shrine in central Bangkok, Thailand, Sept. 9, 2015. Authorities say prime motivation was retaliation for police crackdown on human smuggling, but analysts point to government's decision in July to return 109 Uighurs back to China. Thai authorities have formally blamed last month's deadly Bangkok bombing on a Uighur human smuggling network that officials say was angry about a police crackdown on its business. The investigation into the bombing has been criticized as disorganized with at times contradictory statements by top officials. Thailand’s worst ever single terrorist attack on August 17 claimed over 20 lives and wounded more than 100, leaving a Thai populace fearful and concerned of more attacks. Authorities tried to quickly reassure the public and the country's important tourism industry that the episode was not an act of terrorism, even though they admitted they did not know who carried out the attack. Investigations were initially led by the Metropolitan Police, officers from a local police district and the Thai Special Branch, a special unit that focuses on high-level cases. Concerns about the police investigation came barely a day after the blast when the police announced they had already completed their investigation of the downtown bomb site and dispatched cleaning crews to scrub the entire area. FILE - The next Thai national police chief Chakthip Chaijinda (L) talks with Thai national police chief Somyot Poompanmuang (R) during a religious ceremony near the Erawan shrine in central Bangkok, August 21, 2015. 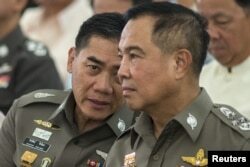 Analysts say the image of the Thai police was also tainted when an $85,000 reward offered by the National Police Chief for information leading to the capture of the bombers was instead claimed by the police themselves. Following criticism, National Police Chief Somyot Poompanmuang handed control of the investigation to teams from the Special Branch. Tony Davis, an analyst with IHS Janes, says the investigation had a breakthrough on August 29 with the arrest of an ethnic Uighur man in suburban Bangkok found with dozens of forged Turkish passports and explosives. 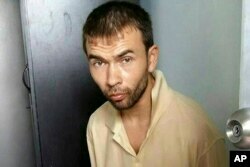 “When they picked up a guy we now know to be a Turkish citizen of Uighur extraction in the apartment in Nong Chok they started to make that progress and once an arrest led to another arrest, obviously police work has accelerated and had made significant strides in the last two weeks,” he said. FILE - This image released by the Royal Thai Police shows a man who was arrested at an apartment on Aug. 29, 2015, in Bangkok, along with evidence police said included bomb-making equipment. Since then police have made at least three arrests, tracking suspects traveling through Vietnam to Laos and Malaysia as well as Bangladesh. The Anti-Money Laundering Office has also reportedly followed the money trail, linking several co-conspirators to funds used for a Uighur human smuggling operation. There is still speculation over what the prime motivation was for the attack. Authorities insist it was retaliation for a police crackdown on human smuggling. But analysts point to the government's decision in July to return 109 Uighurs back to China, after allowing more than 170 others to travel on to Turkey. They were among a group of some 400 Uighurs who had fled to Thailand in March 2014 amid an ongoing crackdown against the ethnic community in China’s western Xinjiang province. Rights groups and Western governments had urged Thailand not to return any Uighurs to China, where they could face retribution. Their forcible return led to harsh international criticism and violent protests in Turkey, where demonstrators attacked the Thai consulate. Thitinan Pongsudhirak, a political scientist at Chulalongkorn University, says the Thai government has a dilemma after coming under pressure from China to send the Uighur men back to Xinjiang province against their will. “So the government is in a tough spot because if it admits to the mistake of sending, deporting the Uighur it means it has come too close to China because China has recognized the military coup last year," he said. "At the same the government does not want to go too far in admitting that a bomb attack was a terrorist operation because Thailand relies on tourism. Bilateral relations with Turkey have also soured. Turkey’s Ministry of Foreign Affairs this week claimed the Thai government failed to inform Ankara that the alleged mastermind had allegedly returned to Turkey by way of Bangladesh and Abu Dubai. Vice president of the Ankara based International Strategic Research Organization, Seluck Colakoglu, says Thai investigators have been saying they are in contact with Turkey, but cooperation appeared weak and it was still not clear whether any of the suspects are Turkish nationals. “The Turkish side is trying to clarify what’s going on, [they] no information for that and we don’t know these suspects have some Turkish fake passports acting these terrorist activities on the ground or Turkey does not know whether these suspects come to Turkey or not. So it’s not clear yet,” said Colakoglu. In the meantime, some 98 Uighurs remain in Thai immigration detention facing an uncertain fate whether they will be deported to Turkey or sent back to China.